From Instructions and Prophesies of Father Seraphim of Vyrytsa. The Elder and priest-schema-monk Seraphim of Vyrytsa (worldly name Vasyly Nikolaevich Mooraviev, 1865-1949) was a wonderful ascetic of the Russian Orthodox Church, generously marked by God with many spiritual gifts: prophesy, wonderworking, and the healing of diseases. During the Second World War, the remarkable Elder, imitating his heavenly Sponsor St. Seraphim of Sarov, stood on a rock for a thousand days, praying for the salvation of Russia. This prayer was indeed effective, and the compelling evidence to this fact is preserved by our contemporaries. In 1949 His Eminance Ilaja, Mitropolitan of Lebanon, came to Russia to relate the truth of how Russia was saved in the war of 1941-1945. The most Holy Theotokos herself uncovered to Vladyka the names of certain righteous through whose prayers God saved Russia. Among the first, the holy Mother named the Elder Seraphim of Vyrytsa and those pious women of prayer who were in Liturgical communication with him. Father Seraphim could see across distance and through time; he could read things in the past and the present, as well as the future of people who asked for his help, he had a gift of vision concerning the fate of the world. Vasyly Nikolaevich Mooraviev (future Elder Seraphim) was born in the village of Cheromushki, Rybinsk region, near Yaroslavl. His parents, Nikolai and Khitonia, were peasants. After his father's death, 10-year-old Vasyly was left with his mother, who was sick, and his little sister Olga (died at the age of 2). The Lord helped the orphaned family in their sorrow: and a good man appeared among their neighbors, who worked in St Petersburg as a steward in a store. The man took Vasyly with him to the capital and hired him into the store as a salesman. Before the revolution, people from the region of Yaroslavl were famous for being good salesmen, and for the reason the majority of the personnel of this famous shopping center "Gostynny Dvor" was from there. The dream of the boy's soul was to join a monastery. One day he decided to test his fate: after asking his employer's permission, he came early in the morning to the gate of Alexander Nevsky Lavra (a large monastery in St.Petersburg) desiring to see the Rector. Because of the early hour, he was offered a conversation with a monastery schema-monk. Vasyly knelt down before the Elder begging to be taken into the monastery to do any kind of work. But the answer of the sage Elder was to stay in the world, build a pious family, raise children, and after that, upon mutual agreement with his wife, spend the remainder of his life in monastic labors. Many years later, Father Seraphim told this story about himself, but never mentioned the name of the Elder. Being meek and obedient, Vasyly accepted the words of the Lavra Elder as a blessing from God and lived his whole life as God described for him through his messenger. Vasyly Nikolaevich married at the age of 24. His wife Olga Ivanovna Naidenova also had a dream of being a nun in her youth. One time she went on a pilgrimage with her relatives to the Iveron convent and met there an Elder nun who blessed Olga to live in the world, get married and only after that to take monastic woes upon mutual agreement with her husband. After the wedding, the owner of the store, where Vasyly worked, donated to his favorite hard working steward a significant amount of money that was enough to open a separate business. Vasyly Nikolaevich started a fur preparation business. Things went so well, that in a short time he became quite rich. The Mooraviev family received their spiritual support from a well-known Elder of that time, hieromonk Bamaba (Merkulov), who, most probably, gave his blessing for the major changes in their life. The Lord had called His chosen one to a special service. Because of his business, Vasyly made many trips to foreign countries. The last trip was especially long. Reportedly, he visited Mt. Athos. Apparently, his desire to completely dedicate his life to God and people ripened at that time. Vasyly gave away the major part of his wealth, donated to monasteries, and left significant money to his fellow workers. He was 30 years old at that time. This is a story of that period told by the Elder himself. One day a thief broke into his house, took the most valuable things, tied all in a cloth and went out. He had hardly stepped out of the house, when the cloth untied and the items fell out on the ground. The thief started picking up the loose items in panic. At that very moment the owner of the house (Vasyly) showed up. The thief was scared, but the fixture Elder helped him to pick up the things, tied the cloth, put it on the thief s back and left for the house. The Elder said that the sin was removed from the thief, because in this case he did not steal, but was willingly given these things. Father Seraphim repeatedly told his spiritual children: "If you lose something, do not be upset; if you find or receive something, do not be too happy, but thank God for everything." According to his spiritual children, he entered the path of Eldership at the age of 33. He was known to have spent certain time on Mt. Athos, where he prayed to be instructed in his future life. After a 40-day-fast, the Mother of God appeared to him and said: "Go to Russia." There is evidence that upon his return from Mt. Athos, Vasyly Nikolaevich met with Father John of Kronshtadt, who called him by name and said that the Mother of God sent Vasyly to Russia from Mt. Athos. Most probably, Vasyly started his labor of Eldership with a blessing from the Great Pastor, John of Kronshtadt. Many visitors came to the holy Elder for spiritual advice, instruction and support, looking for help with their worldly problems, sorrows or diseases. Those who remembered the Elder in the pre-Revolutionary period, told about his marvelous gift of insight, his abundant ability to heal the sick; whereby in accordance with his prayers the lame would walk, the blind would see, the deaf and the mute would start hearing and speaking again, the sick would get rid of deadly diseases. In 1927 the Elder became a schemamonk with the name of Seraphim, in the honor of Blessed Seraphim of Sarov, and joined the Monastery of St. Alexander of Neva (Alexandro-Nevskaya Lavra in St. Petersburg). The brethren of the Lavra selected him to be their spiritual Father. Very soon word about the exceptional ability of the Lavra's spiritual father spread throughout the orthodox community of St. Petersburg. The Elder often served in the Lavra's Church of the Intercession, listened to confessions and gave communion. There always was a crowd of visitors. The Elder also received the people in his cell. When the number of visitors was too big, or the Elder was sick, people would send him messages through cellmates and the Elder would respond to them all. A woman remembered how because of the huge crowd she could never make it to the front to see the Elder, and she felt it would be inappropriate to elbow her way forward, and even had no energy to do so. And every time she came, the Elder would immediately send a cellmate who asked "Where is (certain) "Anna," the Father wants her to come forward." 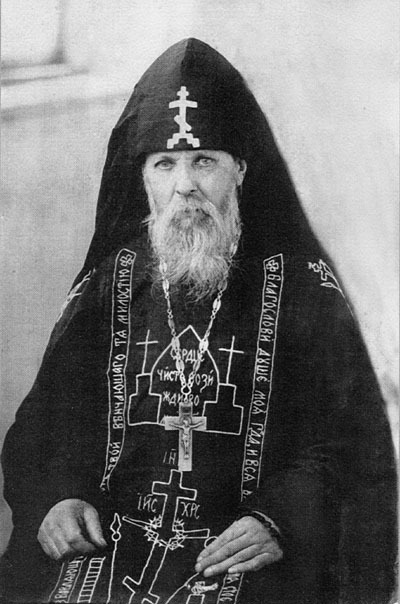 In 1927 Alexei (Simansky) Archbishop of Khutyn, a head of the Novgorod diocese came to Elder Seraphim for advice. Vladyka Alexei was offered assistance to emigrate in order to escape an almost inevitable future arrest and probable shooting. Even before Vladyka asked his questions, the Elder said: "Many are trying to flee abroad now. Who shall we leave Russia with, then? There is nothing you need be afraid of, Vladyka. You are needed here in Russia. You will be a Patriarch of Russia and will rule for 25 years. After the Most Reverent Patriarch Tikhon, there will be no Patriarch for some time. Metropolitan Sergy will last for only less than a year, then you will be a Patriarch. Then, there will be a war, a horrible war, in the whole world, this war will bring Russia to God. The same rulers who are closing the churches now will start opening them." In the meantime the skies above the Lavra were darkened, and the sufferings of the Passion Week came to the monastery. Overnight the whole community was arrested and exiled, or thrown to prisons, camps, and many died as martyrs. The majority of the brothers was sent to Solovki. Together with other monks of the Lavra, Elder Seraphym went through this long period of suffering. Whenever he happened to be — camps, prisons-he continued his labor as an Elder and spiritual instructor, strengthening those who were weak, or sick, encouraging them and fostering their faith. In 1933 he came back from exile and settled down in the little town of Vyrytsa (St. Petersburg region). Having hardly recovered from his sickness, being physically frail, the Elder started receiving those who needed his prayerful intercession, healing, and comfort. The place where God directed Elder Seraphim to reside deserves special mentioning. For the reason he would call Vyrytsa a "holy land" and "our Northern Jerusalem." The name Vyrytsa is derivative of the Russian word "Vyr" which means "the depth," "vortex." This can be attributed to the river Ordezh which flows there and is the right influx of the river Luga which has a lot of whirlpools in its flow. The number of people who would flee to Vyrytsa to receive the prayerful support of the Elder was so great that it could not go unnoticed by the local authorities. The Elder's cell was repeatedly exposed to searches. During one of the searches, when the Elder was in bed sick, he attracted one of the KGB men, and looking at him lovingly and silently praying to God for him, took his hand and said "Let the merciful Lord forgive all your sins, servant of God (and named the man)." And the force of love prevailed. The face of the fearful visitor softened. The conversation ended as if they were long-time friends with the Elder. The hearts of others softened too. Totally frail, being bedridden during almost all of his last years. Father Seraphim spent all the nights through in prayers, while in the daytime thousands of people would bring to him their sorrows and sicknesses. When the Second world war broke out, many of the people ofVyrytsa came to him to ask what to do, whether to leave their homes and go with the evacuation, or to stay. The Elder answered with confidence: "Your homes will be safe. No damage will be done to Vyrytsa. Not a single person will die here." And that was exactly what happened. The German troops invaded Vyrytsa in September 1941, but there was neither looting, nor killing. The Germans, having learnt about the holy Elder, visited him, asked what would happen, whether Hitler would win. Father Seraphim openly told them that Hitler would not conquer Russia: "You will never take St. Petersburg. We are the orthodox country. Right now the faith is persecuted, but it will revive soon." The Elder prayed to the Mother of God and to Blessed Seraphim of Sarov, and we have the wonderful evidence of how efficient his prayers were. In the Winter of 1942, the Elder's caregiver Mother Seraphima had a dream: "Father Seraphim in his felt boots and white gown drove out a multitude of armed Germans along the snow field, they were running from him in horror." In the morning when the old woman came to Father Seraphim for the blessing, he said "You saw it, now go and please dry my felts and the gown." In fact, every night the Elder came out to the garden to pray on the rock wearing his felt boots and covering himself with the white gown so that the neighbors would not see him in the snow. "His felts and the gown were wet every morning" — the caregiver remembered, — "Only God knows, how could he endure these all night vigils having such sick legs." ... The spring of 1949 came. The Elder was very sick. His spiritual children prayed about his recovery, saying that it was too sad to part with the dear Father. Father Seraphim's response to this was "Don't you believe that God will not hear? If I only stretch my hands to him, he will heal. But not my will, let Thy will be done, now and ever and unto ages of ages. Let whatever diseases come — Thy will be done." The Elder was very frail and totally bedridden, but requested that all who came to visit him be let in. But his caregivers, feeling sorry for the Father, did not allow the people to come in, although he knew, through the spirit, who came and what their needs were. So he insisted that the people were brought back who were denied a meeting with him. Sometimes he was so insistent, that firm that people were brought right back from the train. Shortly before his repose, the Elder slept through twelve days straight, without awakening. A physician would came to examine the heart, and the old man's pulse could hardly be heard during theses days. When the Father woke up, he said addressing Mother Seraphima, his caregiver: "I have been to many countries, and could not find a country better than this and did not see faith better than ours, tell the people so that no one will ever depart from Orthodoxy." The blessed Elder died the night of April 3, 1949, in the house on Maysky Prospect. After his repose people ofVyrytsa could smell a sweet fragrance everywhere for the entire week. 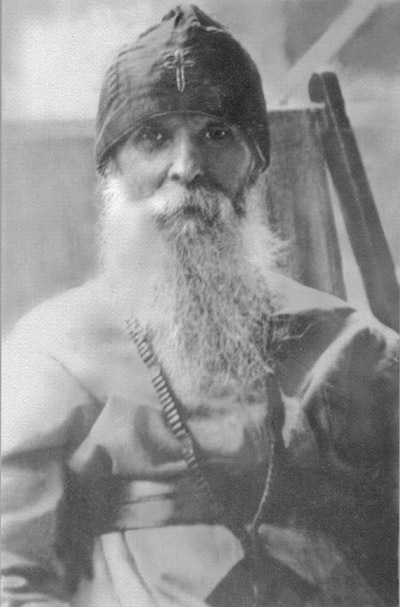 of Father Seraphim of Vyrytsa. "God is strong enough to restore those who labor, if we ask Him. Let us keep praying and begging — and God will recover even from stones his chosen ones." "At least once in our life we need to light a candle for those we have offended, or deceived, from whom we stole, or to whom we did not pay debts." The Elder said that the time would come when 40 people would cling to every believer for he would save them. "God would wait for a thousand years that at least one man might be saved to replenish the number of fallen angels." The Elder said that God gave us a soul, but our body is inherited from our parents and grand parents, that is why together with our body we receive part of their sins. They are waiting for our prayers and feel great joy when we pray for them, and those who are in the Heavenly Kingdom help us. The Holy Elder could see not only the future lives of people, but also the future of our church and the country. The witness to it is his poetry written in 1939: The storm will pass over the land of Russia God will forgive the sins of Russian men. The Holy Cross in its majestic splendor will shine above the churches' domes again. The bells will ring awakening from horror from sins to salvation The holy houses of the Lord will open their doors ,and faith in God will bring us all together. The Elder said that the time would come when the beginning of the verse will read as "The storm has passed over the land of Russia." One time to answer his spiritual son's question about the future of Russia, the Elder suggested to him to look out the window. The man saw through the window the Gulf of Finland and many ships under different flags in it. "What does this mean?" — He asked the Father. The Elder answered: "The time will come when spiritual life in Russia will blossom." Many churches and monasteries will be opened, even people of other religions will come here to be baptized in Orthodoxy. Although this will not last long — maybe fifteen years, after which Antichrist will come." He would say that after the East becomes strong, the world would become unstable. "They are bigger in number, and not only that — their workers are honest and sober people, and here — so much alcoholism..."
As those witnesses remember, the blessed Elder said: " the East will be baptized in Russia. The Heavenly Kingdom and those on earth who understand pray for the enlightening of the East." "The time will come when Russia will be torn into pieces. The entire country will be partitioned first and then despoiled. The West will welcome the decay of Russia and till a certain time will agree that China takes the eastern part of Russia. Japanese will lay their hands on the Far East of Russia and the Chinese — on Siberia; they will move to Siberia, marry Russians, and in the long run by means of treachery and deceit, will occupy the territory of Siberia all way to Ural. When they are ready to go further, the West will resist it." "Many countries will assail Russia, but she will hold out, although she will loose a major part of its territory. The war mentioned by the prophets and the Holy Gospel, will cause the unification of mankind. People in the world will understand that they are moving to a dead end, destruction of everything live, and will eventually elect a Common Government — this will be a precursor of the enthronement of Antichrist. Then, the persecution of Christians will start all over, people will flee to Russia in huge numbers, and one will need to go with the first, for many who stay will perish." The Elder loved young people with all his heart. At that time young people went to church very rarely, if ever; so he was especially happy when they visited him. Father Seraphim spoke about the tremendous role of young people in the future rebirth of the Church. He said that "the time would come (and is already coming) when immorality and corruption will reach the lowest depths. There will be scarcely any purity left in young people. They will see no showstoppers in satisfying their whims, for they will be sure in their impunity. They will get together into groups and gangs to commit robberies, and live dissolute lives. At a certain time there will be a call from God and it will no longer be possible for them to live that kind of life, and they will turn to God, everyone by his own road, many will feel a craving for asceticism. Those who were sinners will be in the churches, fallen people will feel a strong need for a spiritual life, and many will become monks and nuns. The monasteries will be reopened, the churches will be full of people the majority of which will be young. The young will be going on pilgrimages to holy places — what a wonderful time this will be! The more they sin now — the more fervent their repentance will be. As a candle sparkles bright before it goes out, the same with the life of the Church. This time is near." "God blessed Russia so generously with richness and beauty: forests, lakes, rivers, and mineral resources. Sadly, people live without God, but the earth is the mother, she gives bread and life. The enemies — the God battling authorities will not let people get back to the earth for a long time. The earth can feed everybody and everything can be set, but this not what the enemy wants, not a newly born Russia. Nonetheless, Russia will live from her earth." "Jerusalem will become the capital of Israel and in time must be the capital of the world. For it is the center of the earth, the Savior of the world was crucified there and raised from death." Father Seraphim knew about his future glorification and said: "Do not haste to dig my body out. Rely on God... I do not want my body to be subject to trade." His spiritual children preserved one more verse of the Elder written in 1946: "Glory to the marvelous God our Lord! Sing and rejoice, oh my soul I am in craving for a holy abode Where Jesus is the sweetest of joys You alone are the hope of my life In sorrows and sickness, my strength Be my joy, my cover and hope I give my whole life to you Glory to the marvelous God our Lord! Sing and rejoice oh my soul I am in craving for a holy abode where Jesus is the sweetest of joys."